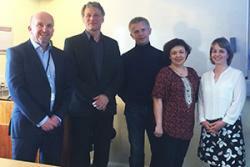 Dr Llion Jones, Prof Jerry Hunter (left) and Dr Lowri Hughes (right) with the Russian visitorsAcademic researchers from Russia were recently welcomed to Canolfan Bedwyr, Bangor University’s Centre for Welsh Language Services, Technology and Research. Professor Konstantin Sulimov and Dr Nadezhda Borisova from the Political Science Department at Perm University, are currently working on a major research project focussing on the relationships between ethnic minorities and the states to which they belong. Having decided to look specifically at the relationship between Wales and the United Kingdom, they visited Bangor University on the basis of its international reputation in the areas of language planning and Welsh language support. Professor Sulimov and Dr Borisova were formally welcomed to Bangor by Pro Vice-chancellor Professor Jerry Hunter (Welsh Medium and Civic Engagement). Following a presentation from the visitors on their research project, Professor Hunter, joined Dr Llion Jones, Dr Lowri Hughes and Delyth Prys from Canolfan Bedwyr and Dr Cynog Prys from the School of Social Sciences in outlining the various strategies that are being implemented in Wales in order to promote the Welsh language and preserve the rights of Welsh speakers.